Notre Dame returns to the national championship to face a Baylor team that is making its first appearance since winning it all in 2012. Muffet McGraw kicked off Final Four weekend on Thursday afternoon with a serious and vitally significant viral video, sitting up on the press conference dais and eloquently championing gender equality both in sports and society. A day later, as Friday night turned into Saturday morning at the Amalie Arena in Tampa, her Notre Dame players were sitting in the home locker room, laughing and passing around a cell phone that showed a different video in which their coach, again, was in the process of going viral. This time the clip was of an ebullient McGraw doing an Irish jig on the court. This time her mood was unfettered jubilation. The coach had ample reason to celebrate. After a heart-palpitating rematch with rival UConn, a game in which the Irish trailed by as many as nine points in the fourth quarter before storming back late to earn an 81-76 win, Notre Dame was heading back to the national title game on Sunday. This time it will be looking to earn a rarefied sobriquet in college basketball history: back-to-back champions. It had been said all week—this was the greatest rivalry in women’s college basketball. It had been said so much, so often that one could almost expect that the game would not live up to its hype. The reality was just the opposite, as the two powerhouse programs battled back and forth for 40 minutes, trading basket for basket, block for block, until the very waning moments of the night. In the beginning, though, the teams traded brick for brick and turnover for turnover. The game began slowly; both squads looked unsteady. In the first half, neither team shot over 36% from the field and together combined for 3-of-25 from behind the arc. The Irish struggled to get into any rhythm offensively. Last season’s hero, guard Arike Ogunbowale, was cold, with only two points on seven shots. Marina Mabrey, the team’s sniper from deep, clanged six of the seven threes she attempted. It was only forward Jessica Shepard’s 12 points that kept the game close early as the Huskies—led by Napheesa Collier’s 11 points and six boards—went into the half clinging to a one-point lead. The Irish—a team that entered this season with talk of possibly having the most talented starting rotation in college basketball history, but went on to stumble with three losses, including to the Huskies, in December—settled down in the second half. The offense began to resemble the well-oiled machine it should be, with every player on the floor a threat to score at any time. All five Irish starters would score in doubles figures, including a game-high 23 for Ogunbowale who, as she often does, gained more confidence as the end of the game neared and the stakes rose. But for most of the second half, the two teams simply traded baskets back and forth. In recent days the Irish had studied that December loss to UConn, talked about how the effort wasn’t there on defense, how the ball wasn’t shared enough on offense. They collectively promised that these were things they would shore up this time. But still, after a series of breakdowns on both sides of the ball, they trailed 64-55 with just under eight minutes left. The momentum in the arena had fully shifted; the Huskies, who were fighting for redemption after Notre Dame ended their season in the Final Four last year, seemed to have the game in hand. They had firmly established control. But in the Irish's huddle, there was no worry, no panic. And so that’s what the Irish did. They locked in defensively. Brianna Turner, who missed all of last season with an ACL tear, led the way with five blocks and stifling defense in the post. They shared the ball on offense, not settling for isolation plays but rather spreading it around and finding the open shot. Soon, the nine-point deficit had turned into a tie game, 66-66, with just over four minutes left. Then there was Ogunbowale with a steal; the guard pushed out front, leading a fast break, but instead of forcing it on her own, she found Shepard on the block, who quickly sent it back to Ogunbowale for the jumper and the lead. Then, after the Huskies tied it back up, it was Ogunbowale again looking for a teammate down low, this time Turner, who then turned and found Shepard for an easy lay-up. Poetry in motion. With Notre Dame up three and just under a minute remaining, it would take one more defensive stop—of course—to send its coach dancing. And, of course, it was Turner who stepped up again, a crucial block on a Collier layup attempt that all but ended the game. The Irish, last year’s Cinderella’s story, this year’s juggernaut, would be playing on the last day of the college basketball season, yet again. As the buzzer sounded, McGraw was engulfed by a mass of coaches and players. They were hugging, smiling, and all screaming one thing: We did it again. Three hours earlier, as the final buzzer sounded for the first game of the night, Kim Mulkey did not celebrate. She did not yell or exalt or display much emotion at all. The Baylor coach simply dropped into a crouch, her bright pink pantsuit bent at the knee, and exhaled. Coming into Friday night, the first Final Four game was pegged as a battle of two drastically different styles—Oregon’s freewheeling, three-point-hoisting, new age aesthetic vs. Baylor’s concerted, back-to-the-basket, old school approach. The Ducks were the most accurate three-point shooting team in the country, with the walking triple double, the woman Steph Curry recently called a “legend,” Sabrina Ionescu frenetically leading the charge. The Lady Bears were the best defensive team in the nation all season, with the best field goal percentage allowed, led by a player, the 6’7” Kalani Brown, whose game is described as one that comes from a bygone era of basketball, a time when true centers reigned supreme. The question going into the game was which team would be able to assert its particular style of play? Who would be able to force their will onto the other and control the pace? It turned out that, in many ways, both teams did. The style seesawed back and forth every time the ball changed possession, with Oregon looking to push, spread the floor and launch jumpers and Baylor attempting to slow it down and feed the ball into the post. At varying times, each style proved just as successful as the other—with 12 lead changes, 12 separate occasions when the score was tied, and a narrow, exhilarating finish, with Baylor claiming the 72-67 victory. At the beginning, the Bears came out slow and seemed too intent to establish their game plan as, at times, forcing the ball into their two dominant low-post scorers—Brown, 22 points on 9-of-12 shooting, and 6’4” forward Lauren Cox, 21 on 9-of-14—resulting in turnovers, offensive fouls and several three-second violations. The Ducks started hot, hitting their first two three-point attempts. With just under five minutes played, Oregon had already taken a seven-point lead. It would prove to be the largest point differential in the entire game. 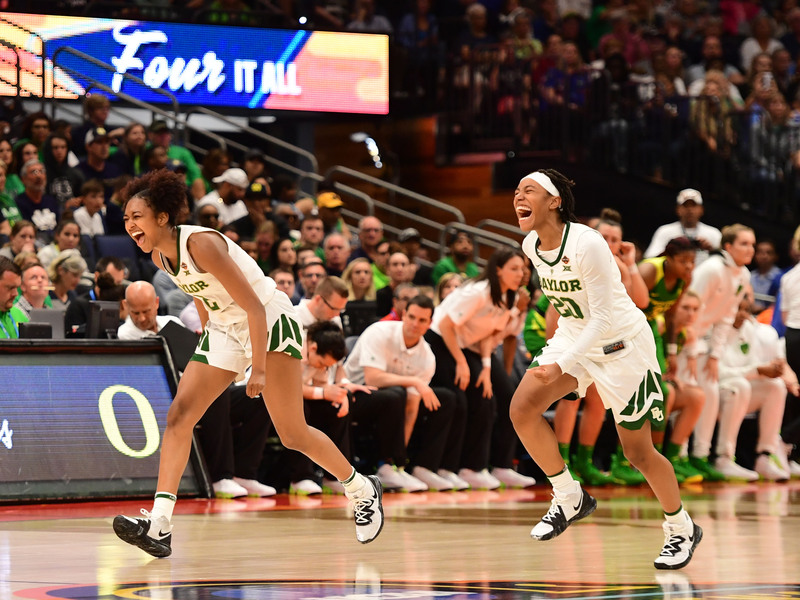 Baylor soon steadied, leaning on its stymying defense (led by guard DiDi Richards, who tirelessly chased Ionescu around the court like she was moonlighting as her shadow) and the one-two punch of their own Waco version of the Twin Towers. Soon, not only had the Bears erased the deficit, but they had taken their own five-point lead as the first quarter wound down. From there, the game would become much, much closer, with a one-point lead often vacillating back and forth between teams. It would go back and forth, and back and forth, and back and forth, for the next 30 minutes, with Oregon running and driving and launching threes (hitting 12-of-32 on the game) and Baylor often pulling back the tempo and desperately looking to get the ball inside. For most of the first half, Richards seemed to frustrate the often-imperturbable Ionescu, but the Oregon guard would soon add another highlight to her everlasting reel. With eight seconds left in the second quarter, Ionescu took a deep three at the top of the key, absorbed contact from Richards, then fell to the floor as the shot fell through the net and a foul was called. Splayed on the floor, the guard then shot a gif-inducing stare Richards's way, sending the Ducks into the half with a one-point lead and their fans into a frenzy. Again Baylor steadied, even as Oregon switched into a 1-2-2 zone to try to protect the paint. Guard Chloe Jackson directed the offense from the outside, methodically moving it from side to side in order to get clean touches inside for Cox and Brown. The pair also manufactured their own offense in the second half, combining for eight offensive rebounds that led to 12 second-chance points. With Richards getting into foul trouble early in the fourth quarter and having to switch off Ionescu, Oregon took a 64-61 lead with just over six minutes remaining. Still, Baylor managed to get five straight defensive stops. With just under a minute left, and the game tied at 67, Jackson took the ball at the top of the key, seemingly looking to set up the offense the way she had all game—slowly. But instead of waiting for the post to open, she faked left towards a screen, then exploded right, blowing past a surprised Oregon defense and driving, unimpeded, to the hoop for the wide open and game-winning layup. It seemed fitting: After winning their four tournament games by 25+ points—only the third team to ever do so—Baylor needed to fight and claw for every second in order to earn its first trip to the NCAA championship game since winning it all in 2012.